This week I am hosting Elliott Holt at one of my reading series, Literary BFFs, where she and her friend Marie-Helene Bertino will discuss their books, friendship, and craft. 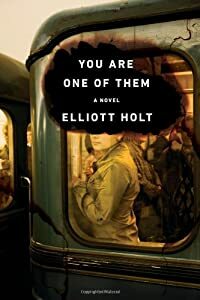 "The main thing, though, is that 'You Are One of Them' is a hugely absorbing first novel from a writer with a fluid, vivid style and a rare knack for balancing the pleasure of entertainment with the deeper gratification of insight." For a chance at winning this book and a $100 Threadless gift certificate, tell me who your "literary BFF" is (a friend, website, critic, newspaper, magazine, publisher, writer, etc.). I am personally infatuated with Tin House, both the literary quarterly and publisher. The winner will be chosen randomly at midnight ET Friday evening (June 14th).